We all love to brag. Startup founders love to brag about big growth numbers; like the numbers of their registered users, app downloads, and raw page views. They will even publish them for bragging rights while happily linking to Alexa and QuantCast as proofs that they are doing well. Everybody does that. Reddit, Jobberman, IrokoTV… And the list goes on. Does this mean they are doing well? This metric, most of the time does not necessarily correlate to the numbers that really matter or show the true health of your business. They are vanity metrics and could be dangerous for your business. Why would I say so? So if you are building a success-bound venture, your goal is to look at your business growth differently by setting specific targets to measure the growth and improve the performance of your start-up. I am convinced that there is a better way to look this. In fact, I wrote a long and critical piece ongrowth and how to make it happen. (Caveat: it is a LONG post with useful business insights revealing how I helped a startup grow to their first 10,000 customers in 3 months). How Do You Decide What to Measure in Your Startup? So how do you decide what to measure? When deciding what to measure, you want to focus on quantifiable factors that are clearly linked to the drivers of success in your business. One person that does this right is Jason Njoku of IrokoTV. On his blog, his analyses of revenue per customer here, here and here are solid fundamentals to measure in your business. I will create an example that will assist you understand this concept of how to set useful targets for your website. The first step is to start with objectives because a good measurement plan starts with you documenting your business expectations. In this document, you ask yourselves soul searching questions like: why do we exist? What are our ultimate goals? That means that primarily, the objective is in getting the best guys to write blog post on TechCabal and also, to build a community of people to comment on posts and engage on social media based on discussions that start off on this blog. (Don’t forget that this is all fictional……… I want you to relate this example to your own project: a blog, an app or website). STEP 2: Decide on the strategies and tactics to achieve your objective(s) above. The next step is to break down your objectives into strategies and tactics. This makes it easy to develop a system. Using the TechCabal example above, an effective strategy could be to have a minimum of 30 high-profile columnist across venture capitalists, startup founders and developers. This variety is expected to provide informative posts that cut across the needs of the website audience. STEP 3: Thirdly, track your traffic channel. Traffic is the blood of your business. And you want traffic ready to convert to repeat visitors and paying customers. In our TechCabal example, we’re going to track all traffic channels to see what contributed torevenues, blog engagements (comments) and the social media reach of the blog. What channels brings the most visitors to the site: Email (newsletter subscribers), twitter or LinkedIn? Based on blog comments, which type of blog post/editorials engages our users the most? Which of the authors contribute most significantly to website traffic? Are our reposts on LinkedIn Pulse doing better that twitter updates? 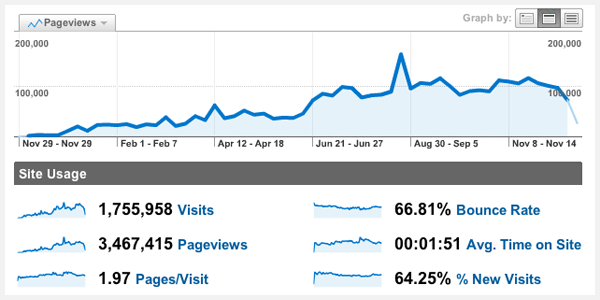 Are the comments showing new opportunities for blog posts we should be focusing on for growth? The traffic channels you choose can be the same or different across all of your website objectives; it all depends on what your business is doing and which strategies and tactics are being used to reach your objectives. Finally, let’s set a target for a single traffic channel…….. Email sign ups. 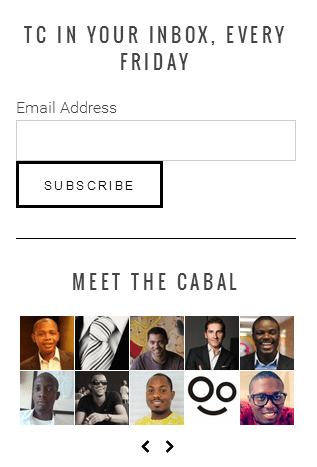 If you have noticed, you see that the real TechCabal website has an email sign up page. A typical target can be to grow the newsletter sign up rate. For example, TechCabal can set a target to measure the conversion of website visitors that sign up for the newsletter. If this is currently low, a strategy can be designed to increase the sign up rates (This means that a revenue opportunity has just been met). The more specific the target is, the easier it is to measure and optimize the goal performance. So what is the best tool to do this? There are several good options I can recommend for you; both free and premium. However, it is important to understand that metrics for metric’s sake are not very useful. The truth is there are many useful tools to do this. But for starters, let’s look at one of the most useful…….. And a FREE option. It is called Google Analytics. 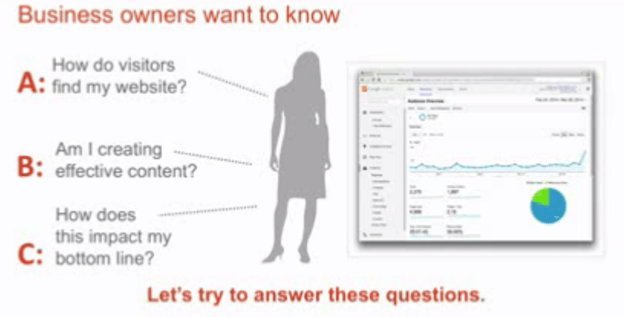 Google analytics dashboard has four major categories that assist you to build your audience based on data that assist you to serve your current customers and win new ones. They are Audience, Acquisition, Behaviour and Conversion overviews. The truth is that when you understand the metrics that impact your business, you will make right decisions on your advertising budget, staffing and business priorities. This is because business should be about success stories when the right things are measured. 4 replies to "How To Set Useful Targets To Measure The Growth Of Your Startup"